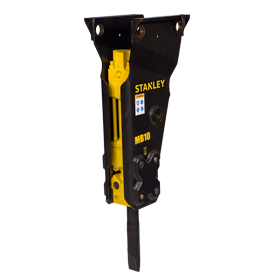 STANLEY is proud to introduce a new premium line of breakers, the MB/XP series, into the mid-sized range of mounted breakers. 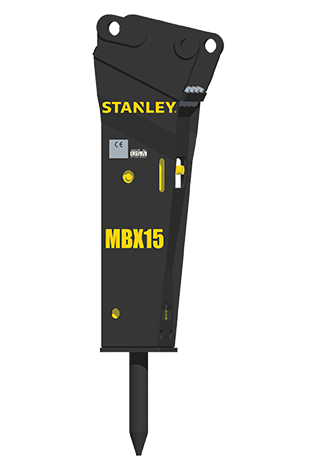 The MB/XP series is comprised of high production breakers for the most demanding applications. 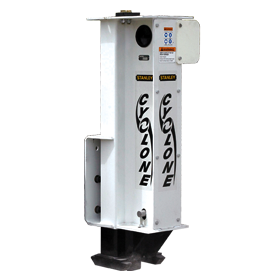 With a wide range of carrier compatibility (from 12 to 80 metric tons) there is a breaker for every job, whether you’re doing commercial demolition, road building, quarry work, or production breaking. The MBX series packs serious force and is designed to break a wide array of materials. 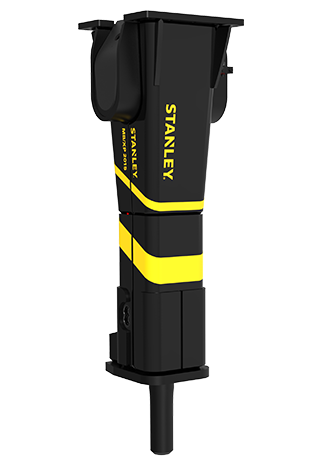 The MBX series features a patented valve system that dramatically increases the durability and performance of the tool. 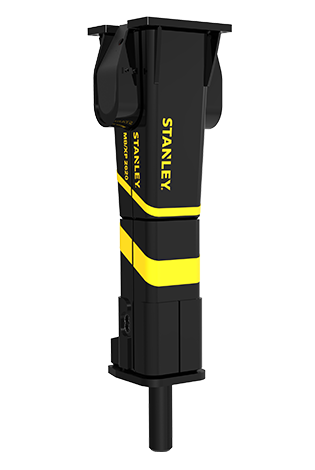 Less maintenance is required over the life of the breaker because the design has only two moving parts, limiting the need for servicing. •Auto-Lubrication to assist with important tool maintenance. 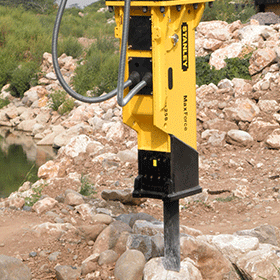 The breaker-mounted, large capacity lubrication device automatically provides grease to the tool and bushings. 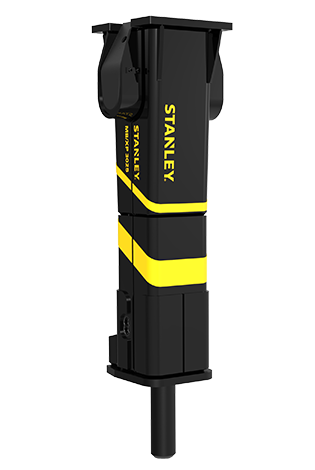 •Mounted SDC Tracking Device helps operators and service personnel with maintenance planning, service tracking, and accumulated work history. 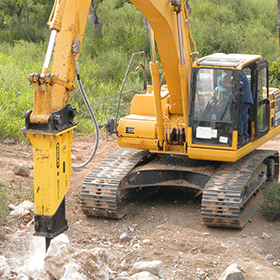 •Heavy Duty Housings and Wear Plates for extreme durability in the harshest of applications. 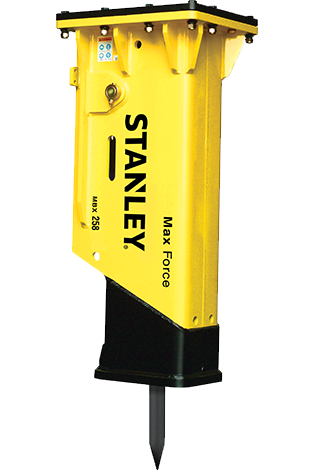 •Fixed Impact Energy Valve allows for use on a wider range of carriers. 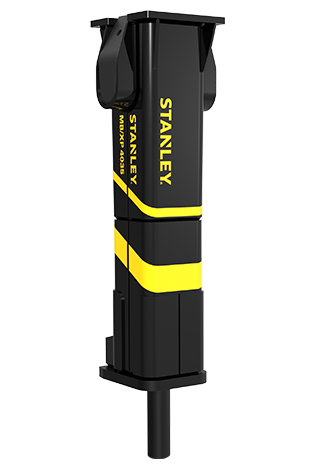 •Vibration Dampening Tie-Rods to maximize uptime. •Membrane Type Accumulator eliminates time consuming recharging. •Idle Blow Protector prevents blank ﬁring. •Underwater Capable on specific models to increase versatility. •Hydraulic Overﬂow Protector for added durability.